A new take on soaring avionics. AIR Glide offers a unique line-up of flexible, high quality and easy-to-use soaring avionics. With AIR Glide there is no distinction between „variometer“ and „glide computer“ in your cockpit anymore. It is all up to you: take a Sensor Unit and any number of displays in any size and combine them in any way you want. All AIR Glide devices are compatible to each other and share a common design. 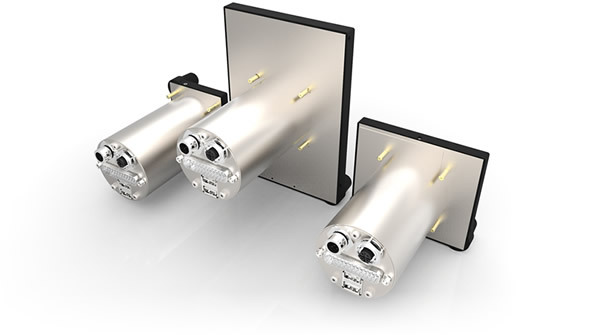 This product line strategy, that we have introduced with the Butterfly Vario in 2011, allows for simple combination and exchange of all AIR Glide devices. Existing installations may be easily extended. 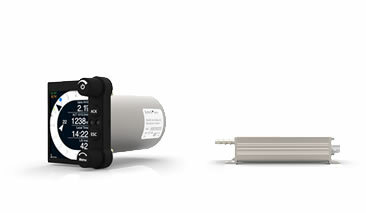 Older units can be exchanged against newer versions, for example if new sensors become available, without the need for changing the whole installation - reducing costs and securing your investment. We have designed every aspect of AIR Glide devices with quality in mind. All parts are crafted from metal, connectors, displays, and even cables are robust industrial grade components. In terms of temperature, shock and vibration we applied design standards for professional, certified avionics systems. Compared to other equipment with plastic enclosures and consumer technology AIR Glide devices stand out. The heart of every AIR Glide installation. The sensor unit contains all sensors and an IGC certified flight recorder. Computes vario, airspeed, instantaneous wind, air mass movement, GPS-Position, magnetic heading and attitude. Our smallest display is the perfect primary vario indicator. It features variometer indication, speed-to-fly indication, backup navigation, traffic awareness, voice alerts, and artificial horizon. The display can be installed into existing 2.25" panel cutouts. 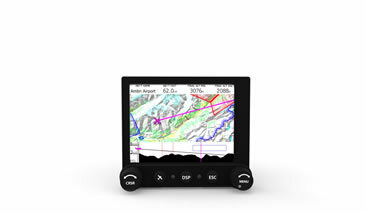 Our largest Display ("size L") has a 5.7" screen and features variometer and speed-to-fly indication, moving map navigation, comprehensive task planning, and optimization as well as traffic awareness. It is controlled via buttons or touchscreen and very easy to use. 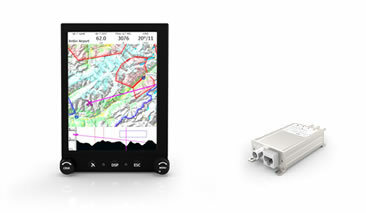 The medium sized display ("size M") has a 3.7" screen and features variometer and speed-to-fly indication, moving map navigation, comprehensive task planning, and optimization as well as traffic awareness. It can be installed into existing 3.125" panel cutouts, requiring only a 2.25" cutout itself. 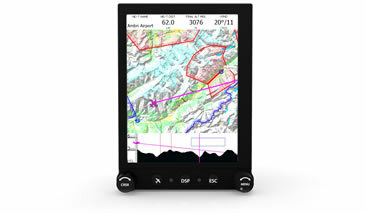 It is possible to use existing PDA navigation systems with AIR Glide. 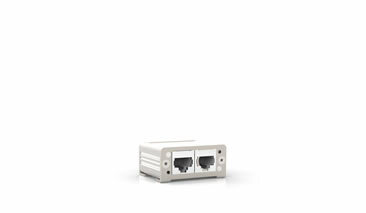 In order to convert the signals from the vario to standard NMEA-signals our NMEA-Interface-Box is used. The NMEA Interface Unit emulates existing data protocols to ensure seamless operation. Cambridge 302, LXWP and VEGA protocols are supported. Our Connect Stick allows for direct wireless communication with iGlide - our moving map solution for iOS® devices. 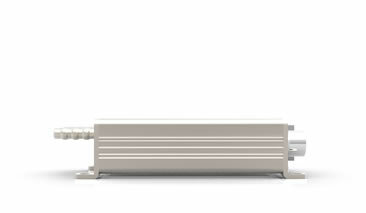 In order to interface iGlide devices (iPhone/iPod/iPad), you insert a Connect Stick to any free USB connector on an AIR Glide display. You can use many Connect Sticks in one aircraft, one stick per iGlide device. Our AIR Glide sensor unit is a sophisticated sensor platform, that integrates 14 different sensors and a fully IGC certified flight recorder in a compact device. With a combination of 14 sensors, the relative air-mass movement and wind arround the aircraft is measured in real time. Independent of his flight direction the pilot sees real time air-mass and wind data updated repeatedly every second. The sensor unit contains 3D accelerometers, 3D rate gyros, 3D compass sensors, and a highly accurate GPS receiver. This makes the Sensor Unit a full-scale inertial measurement unit. These sensors, combined with 4 pressure sensors for cabin-, TE-, static-, and dynamic pressure, generate a vast amount of data that is processed in advanced sensor fusion algorithms to compute the aircrafts current attitude, speed, position, and to determine current wind and vertical airmass movement. The permanent computation of wind direction and strength (we call this "live wind") helps pilots interpret their surroundings in a new way. You can see how wind becomes weaker or still in the center of lift and how air flows into and out of a thermal. Local wind systems in mountainous regions can be easily discovered. The vertical airmass information (VAM) offers a gust independent view on the current vertical airflow, easier to interpret and less prone to wrong indications than average netto variometer signals. Our smallest Display ("Size S") is the ideal choice for display of variometer related information. Display S features variometer indication, speed-to-fly indication, backup navigation, traffic awareness, voice alerts, and an artificial horizon display. It is the easiest and most affordable entry to the AIR Glide product line. The new design concept integrates a big 2.7" display into a standard 2,25" panel cutout. The device is installed from the front of the panel. It is only marginally bigger than a standard 2.25" device and can be easily installed into any existing cockpit. The very bright display depicts all necessary information clearly arranged and bigger than common variometers do. The display utilizes special anti-reflection technology making it perfectly readable in *any* lighting condition.Its readability is comparable to printed paper, making mechanical pointers obsolete. Without mechanical pointers the displayed content can be made bigger and it is possible to suit specific display requirements more flexibly. Display S features a very easy to read variometer page. Additionally it features speed-to-fly indication, backup-navigation, a dedicated traffic display page, and a sophisticated audio and voice messaging system that alerts the pilot in natural voice if there are possible dangers. An attitude and heading indicator (AHI) with true-airspeed indicator is included as well. Our largest Display ("Size L") features an amazing, large 5.7" screen with conventional and touchscreen controls. 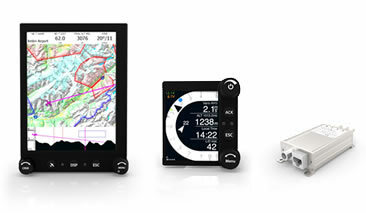 Display L gives you comprehensive and stunningly easy to use navigation, task-management, backup variometer indication, and traffic display capabilities. 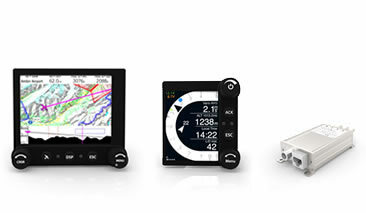 Display L is the first panelmount gliding system to incorporate touchscreen controls. Its all new control concept called Hybrid Touch enables pilots to seamlessly switch between classic button controls and touchscreen based inputs. The bright display provides a large moving map with clearly arranged symbology. The display features special technology making it sunlight readable and still draw less power than conventional displays of similar size. The integrated multi-touch touchscreen is error tolerant and easy to handle, even in turbulent weather. 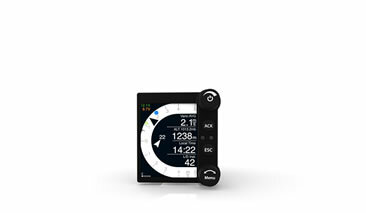 Display L features stunningly intuitive navigation functions. Display L works just as you would expect it to do. It is designed like a smartphone. Menus, functions, and user interface elements will seem naturally familiar to you. Anybody can easily learn how to use it - in just a few seconds of time. Our medium sized Display ("Size M") combines a large screen (3.7") with a mechanical design that retrofits into panels holding old, standard 3,5" (80mm) instruments. Display M features comprehensive and easy to use navigation, task-management, backup variometer indication, and traffic display. The new design concept integrates a big 3.7" display into a small retrofittable device. The device is installed from the front of the panel. It is only marginally bigger than a standard 3.5" (80mm) round instrument and thus can be easily installed into virtually any existing cockpit. The new design concept integrates a big 3.7" display into a small retrofittable device. The device is installed from the front of the panel. It is only marginally bigger than a standard 3.5" (80mm) round instrument and thus can be easily installed into virtually any existing cockpit. Display M features stunningly intuitive navigation functions. It is controlled by just two rotary knobs and three pushbuttons, yet has many amazing features, some of which are unique to panelmount navigation systems. The whole device is designed like a smartphone. Menus, functions, and user interface elements will seem naturally familiar to you. Anybody can easily learn how to use it - in just a few seconds of time. With its easy combinability the AIR Glide product line offers tailored solutions for any cockpit. AIR Glide systems are easy to install, even in cockpits with constrained panel-space. A Display S and a Sensor Unit provides you with the most basic AIR Glide functionality including its advanced sensor technology and IGC flight recorder. In the past we have called this installation "Butterfly Vario". It is an affordable and easy entry into the AIR Glide product line. Required panel space is minimal. With a Display S, Display L, and a Sensor Unit you get full functionality with a large display. This is the perfect choice for aircraft with sufficient panel space. With a Display S, Display M, and a Sensor Unit you get full functionality. In addition to a good vario display a sophisticated moving map navigation system with optimization and competition features is installed. This option fits into existing panels and only requires one 2.25" and one 3.125" panel cutout. With a Display L and a Sensor Unit you can fit a large display into a panel with limited space. The vario indication and moving map navigation are both displayed on a giant 5.7" screen. AIR Glide components as well as a comprehensive line of accessories is directly available at AIR Store. Our team is happy to help if you have questions, just give us a call or contact us via eMail.